PYROVIEW FDS – That is the proven full automatic DIAS infrared system for the early fire detection. It is used for the detection of hot spots or smoldering fires when paper, waste and combustible materials in closed bunkers and in open areas is stored. Reliable installations for the detection and control of unwanted fires are required here in particular. By spontaneous combustion of the stored materials or by contamination of hot materials fire can develop that bears a high risk for man and environment. Insurance providers recommend therefor the use of infrared cameras for monitoring. When exceeding preset temperature threshold values in the Regions Of Interest (ROI) of the current thermal image the corresponding thermal imaging software PYROSOFT FDS signalizes the alarm status and files the appropriate measurement data. In the case of a fire areas with temperature exceedances are marked red. In this way the operator can recognize the fire immediately and start fire fighting measures. Alarms and system states can be displayed on a PC monitor and the operator panel of the system that can be connected directly to the coordination center of the fire brigade. Own water cannons can also be integrated into the system solutions and so they can be aimed to the fire. 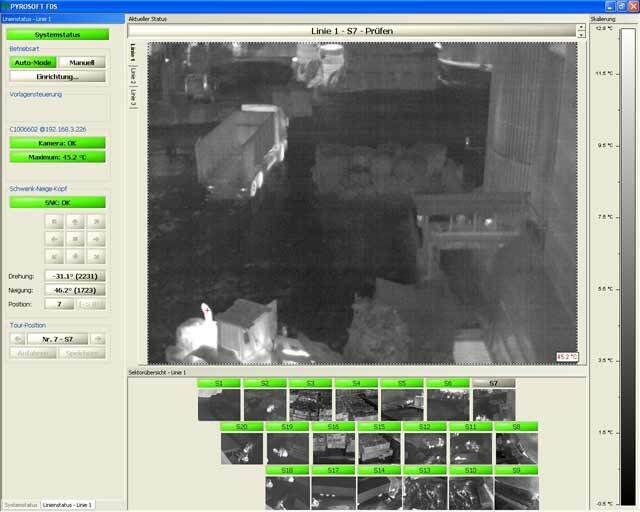 Thermal imaging software for early fire detection: PYROSOFT FDS. 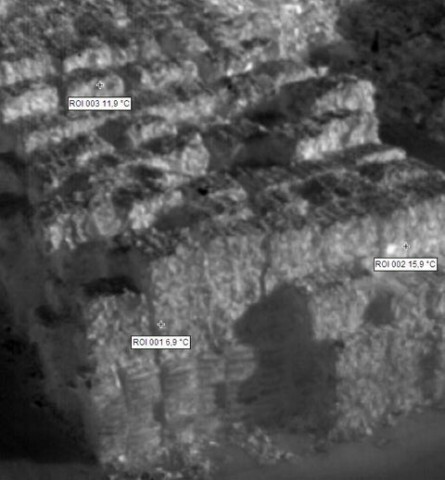 The monitoring of a paper mill is shown on the photo. 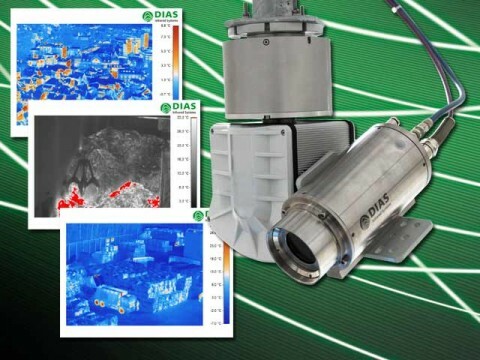 Freely definable regions of interest (ROI) can be set via the thermal imaging software DIAS PYROSOFT FDS for early fire detection. Initial fire in a paper mill: The infrared camera PYROVIEW has detected an area that exceeds the preset temperature threshold. 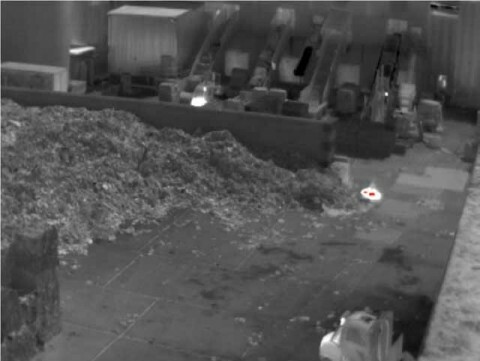 This area is marked red in the thermal imaging software PYROSOFT FDS.